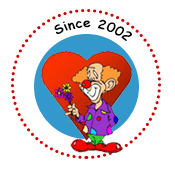 Caring Clowns International operates http://www.caringclownsinternational.org. This page informs you of our policies regarding the collection, use and disclosure of Personal Information we receive from users of the Site. We are very concerned about privacy issues and respectful of your privacy. We do not and will not knowingly violate your privacy. We do not use or circulate information about you with any other entities. While using our Site, we may ask you to provide us with certain personally identifiable information that can be used to contact or identify you. Personally identifiable information may include, but is not limited to your name. Sometimes we will also request information such as e-mail address, address, and phone number. Payment information will be collected through Login with Paypal. Like many site operators, we collect information that your browser sends whenever you visit our Site. This Log Data may include information such as your computer’s Internet Protocol (“IP”) address, browser type, browser version, the pages of our Site that you visit, the time and date of your visit, the time spent on those pages and other statistics. We use Google Analytics to gather this data. The security of your Personal Information is important to us, but remember that no method of transmission over the Internet, or method of electronic storage, is 100% secure. While we strive to use commercially acceptable means to protect your Personal Information, we cannot guarantee its absolute security. We use Login with Paypal to process payments and Wufoo for form submission.